a natural classification of the chemical elements which, in its tabular or graphic form, is an expression of Mendeleev’s periodic law. The periodic system of the elements was developed by D. I. Mendeleev between 1869 and 1871. History. Attempts at systematizing the chemical elements were undertaken in Germany, France, Great Britain, and the USA in the 1830’s. The forerunners of Mendeleev—J. Döbe-reiner, J. Dumas, the French chemist A. de Chancourtois, and the British chemists W. Odling and J. Newlands—established the major groups, or natural groups (for example, Döbereiner’s triads), of elements based on similarities in chemical properties. However, these scientists did not proceed beyond establishing certain regularities within the individual groups. In 1864, L. Meyer proposed a table that was based on atomic weight data, which showed the relationship among atomic weights for several typical groups of elements. Meyer did not make any theoretical generalizations on the basis of his table. 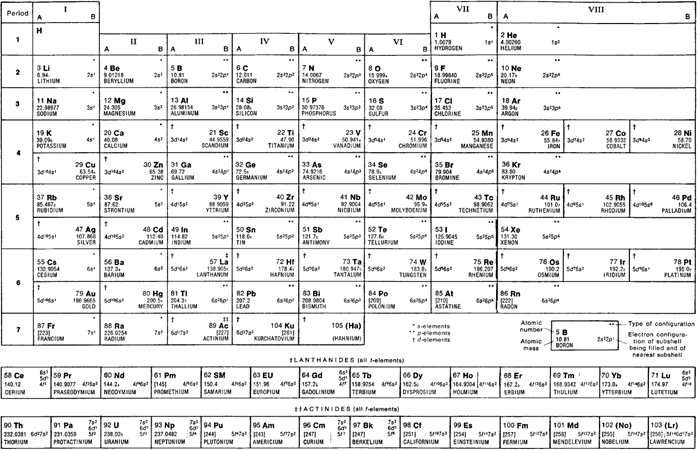 The prototype for the scientific periodic system of the elements was the table Attempt at a System of Elements Based on Atomic Weights and Chemical Similarity, which was compiled by Mendeleev on Mar. 1, 1869. Over the next two years, he improved the table and introduced the concepts of groups, rows, and periods of elements. He attempted to determine the size of the small and large periods, which he found to contain seven and 17 elements, respectively. In 1870, Mendeleev named his system the “natural system,” and in 1871 he changed the name to “periodic system.” Even at that early date, the periodic system of the elements had largely acquired its current form. Figure 1. D. I. Mendeleev’s periodic system of the elements. Atomic masses are in accord with the International Periodic Table of 1973; lowercase numerals with atomic masses indicate accuracy of ±1 or ±3; mass numbers of the most stable isotopes are in brackets. the same group as cesium, Ra in the same group as barium, and Pa in the same group as tantalum. The periodic system of elements was not recognized as reflecting a fundamental scientific law until after the discoveries of Ga, Sc, and Ge and the establishment of the divalency of Be, which had long been considered trivalent. Even after these discoveries, the periodic system continued to be largely an empirical generalization, since the physical significance of the periodic law was unclear and an explanation for the periodic change of properties with increasing atomic weight of the elements did not as yet exist. Thus, until the physical basis for the periodic law and the theory of the periodic system were understood, many facts could not be explained. For example, at the end of the 19th century the discovery of the inert gases was unexpected, since these elements did not appear to have a place in the periodic system. This difficulty was eliminated by introducing an independent vertical grouping, Group 0, which was later called Subgroup VIII-A. The discovery of many radioelements in the beginning of the 20th century caused a problem, since more than 30 such newly discovered elements existed, while there were only seven vacant places—in Period 6 and Period 7—in the periodic system as it was then understood. This problem was alleviated once isotopes were discovered. Eventually, atomic weight lost its significance as a parameter for predicting chemical properties. One of the main obstacles to explaining the physical significance of the periodic law and the periodic system was the lack of any theory to explain atomic structure. Thus, the most important landmark in the development of the periodic system was the planetary model of the atom, which was proposed by E. Rutherford in 1911. Proceeding from this model, in 1913 the Dutch scientist A. Van den Broek proposed that the ordinal number of an element in the periodic system, that is, the element’s atomic number Z, is numerically equal to the charge of the atomic nucleus in elementary-charge units. This proposal was experimentally confirmed by H. Moseley between 1913 and 1914. Moseley’s work proved that the periodicity in the change of the properties of elements depends on the atomic number and not on the atomic weight. As a result, hydrogen—the element with the lowest atomic number (1)—became the first element of the periodic system. The number of elements between hydrogen and uranium was evaluated exactly, and it was assumed that the apparent gaps in the periodic system corresponded to unknown elements with atomic numbers 43, 61, 72, 75, 85, and 87. However, the exact number of rare-earth elements remained unclear, and, more importantly, no explanation had been discovered to account for the periodic change in elemental properties with increasing Z. Later, quantum-mechanical approaches to atomic structure provided this explanation. in Figure 1 contains the currently accepted values for the atomic masses of the elements in relation to carbon, in accordance with the International Table of 1973. For radioactive elements, the mass numbers of the isotopes with the longest half-lives are presented in brackets. In place of mass numbers, the table indicates the atomic masses of the four isotopes with the longest half-lives of all isotopes—99Tc, 226Ra, 231Pa, and 237Np. These masses were adopted by the Commission on Atomic Weights of the International Union of Pure and Applied Chemistry in 1969. Organization. As of 1975, the modern periodic system contains 106 chemical elements. Of these, all the transuranium elements (elements 93 through 106) as well as elements 43 (Tc), 61 (Pm), 85 (At), and 87 (Fr) were artificially produced. During the entire history of the periodic system, several hundred graphic representations, usually in the form of tables, have been proposed; other forms include various two- and three-dimensional figures and analytic curves, for example, spirals. The three most common representations of the periodic system are the short-period form, or short form, which was proposed by Mendeleev and which appears in its updated, universally accepted format in Figure 1; the long-period form, or long form (Figure 2); and the staircase form (Figure 3). The long form had also been proposed by Mendeleev and was revised by A. Werner in 1905. The staircase form was proposed by the British scientist T. Bayley in 1882 and the Danish scientist J. Thomsen in 1895 and revised by N. Bohr in 1921. Each of the three forms has its advantages and disadvantages. The fundamental idea underlying the periodic system of the elements is the ordering of all chemical elements into groups and periods. Each group, in turn, is subdivided into a major subgroup, designated by the letter A, and a minor subgroup, designated by the letter B. Each subgroup contains elements with similar chemical properties. Elements of the A and B subgroups within each group, as a rule, show a certain chemical similarity, mainly in their highest oxidation state, which generally corresponds to the group number. A period is defined as a set of elements whose first member is an alkali metal and whose last member is an inert gas; the first period is an exception to this definition. Each period contains a strictly defined number of elements. The entire periodic system comprises eight groups and seven periods; the seventh period has not yet been completed. The first period is unique in that it contains only two elements: H and He. The placement of H in the system is disputable. Although H exhibits certain properties in common with alkali metals and halogens, it is placed either in Subgroup I-A or, preferably, in Subgroup VII-A. Helium is the first representative of Subgroup VIII-A, although for a long time it was placed with the inert gases in an independent group, Group 0.
has a single oxidation state of I. Be follows, a metal with an oxidation state of II. The next element, B, whose oxidation state is III, is only slightly metallic in nature. The next element, C, is a typical nonmetal and can have a valence of +4 or —4. The next elements, N, O, F, and Ne, are nonmetals; only in the case of N does the highest oxidation state of V correspond to the group number. Oxygen only rarely has a positive valence, while fluorine has been found in an oxidation state of VI. The second period ends with the inert gas Ne. The third period, which extends from Na to Ar, also contains eight elements. The nature of the change of the properties of these elements is highly analogous to that observed in the second period. However, Mg is more metallic than Be, just as Al is more metallic than B; furthermore, Al is amphoteric. Si, P, S, CI, and Ar are typical nonmetals, although all their highest oxidation states are equal to their group number (with the exception of Ar). Thus, in both the second and third periods, the higher the value of Z, the more that element behaves like a nonmetal rather than a metal. Mendeleev considered the elements of the second and third periods—the “short periods,” in his terminology—to be typical elements. It is significant that these elements are among the most common in nature and that C, N, O, and H are the fundamental constituents of organic matter. All the elements of the first three periods are in A subgroups. In the current terminology, the first three periods consist of the alkali and alkaline-earth metals, which are i-elements of Subgroups I-A and II-A (indicated by an asterisk in Figure 1) and of the p-elements B through Ne and Al through Ar, which are in Subgroups III-A through VIII-A (indicated by a double asterisk). For elements in the short periods, at first a decrease in atomic radius is observed with increasing ordinal number, but as the number of electrons in the outer shell increases, the mutual repulsion of these outer electrons enlarges the atomic radius. The next maximum atomic radius is reached in the alkali metal at the beginning of the following period. Approximately the same behavior is characteristic for ionic radii. The fourth period, which extends from K to Kr, contains 18 elements; Mendeleev called this the first long period. After the alkali metal K and the alkaline-earth metal Ca, both of which are s-elements, a series of ten elements that extends from Sc to Zn follows; these are the transition elements. They are d-elements (indicated by a dagger in Figure 1) and comprise the B subgroups of the corresponding groups in the periodic system. The transition elements are all metals, and most have a highest oxidation state equal to the group number. An exception is the triad that consists of Fe, Co, and Ni, in which Co and Ni have a maximum oxidation state of III while Fe under certain conditions can be found in an oxidation state of VI. The series that begins with Ga and ends with Kr contains p-elements that belong to A subgroups; the properties of these elements change in the same way as do those of elements in the second and third periods with corresponding ranges of Z. Kr can form chemical compounds, mainly with F, although it has not been found in an oxidation state of VIII. The fifth period extends from Rb to Xe, and its structure is analogous to that of the fourth period; it includes a series of ten transition d-elements, from Y to Cd. This period is marked by several special features. In the triad that consists of Ru, Rh, and Pd, only Ru is found in the oxidation state of VIII. All the elements of the A subgroups (including Xe) have highest oxidation states equal to their group number. A third peculiarity of the fifth period is that iodine exhibits some slightly metallic properties. Thus, the nature of the change of properties with increasing Z is more complicated for the elements of the fourth and fifth periods, since metallic properties are retained in a large range of ordinal numbers. The sixth period extends from Cs to Rn and encompasses 32 elements. In addition to ten d-elements (La and Hf through Hg), it contains a set of 14f-elements; these are the lanthanides, which comprise all the elements from Ce through Lu (Figure 1). The lanthanides are chemically very similar. In the short form of the periodic system, the lanthanides are represented as fitting into the box for La because their predominant oxidation state is III; they are listed individually in a separate line below the table. This approach is somewhat inconvenient, since it makes these 14 elements appear to be outside the table. The long form and the staircase form of the periodic system do not have this disadvantage and accurately reflect the special features of the lanthanides in relation to the overall structure of the periodic system. The sixth period also has several special features. In the triad that consists of Os, Ir, and Pt, only Os has an oxidation state of VIII. Astatine (At) has more pronounced metallic properties than I. Finally, although its chemistry has hardly been studied, Rn should be the most reactive of the inert gases. The seventh period, which starts with Fr (Z = 87), should also contain 32 elements, of which only 20 are presently known (up to Z = 106). Fr and Ra are s-elements of Subgroups I-A and II-A, respectively, while Ac is a d-element and an analog of elements in Subgroup III-B. The next 14 elements, which are f-elements with Z values from 90 to 103, constitute the actinide series. In the short form of the periodic system, these elements are designated as occupying the box for Ac and are listed individually in a separate row below the table in a manner similar to the lanthanides. Unlike lanthanides, actinides are characterized by considerable variation in their oxidation states, and thus there are considerable differences in the chemical behavior of the lanthanide and actinide series. Investigation of the chemical nature of the elements with Z = 104 and Z = 105 has shown that these elements are analogs of Hf and Ta, respectively, that is, they are (d-elements and should be placed in subgroups IV-B and V-B. The subsequent elements, with Z values up to 112, should be members of B subgroups, while those with Z values from 113 to 118 should be p-elements of subgroups III-A through VIII-A. Theoretical basis. The theory underlying the periodic system attempts to establish specific rules for constructing electron shells and subshells in atoms as Z increases. These rules were developed by Bohr between 1913 and 1921 as he was considering the periodicity of the change in properties of chemical elements in the periodic system and the results of studies of atomic spectra. Bohr discovered three significant features of electron configurations. With the exception of shells that correspond to the principal quantum number n = 1 and n = 2, shells are not continuously filled to their complete capacity, but rather, filling can be interrupted by sets of electrons that are placed in shells with higher values of n. Similar types of electron configurations are periodically repeated. Finally, with the exception of the first and second periods, the ends of periods do not coincide with the capacities of the consecutive electron shells. In terms used in atomic physics, a practical method for forming electron configurations of atoms with increasing Z may be presented in the format used in Table 1. According to this method, the periods are separated by vertical lines and indicated by numbers that appear at the head of each column. The subshells that complete a shell with a given n are indicated in boldface type. The values of the principal quantum number, n, and the azimuthal quantum number, l, that describe the sequentially filled subshells are given below the designation for each subshell. In accordance with the Pauli exclusion principle, the capacity of each electron shell is 2n2, while the capacity of each subshell is 2(2l + 1). Thus, using the quantum values presented above, the electron capacities of the consecutive periods are, starting with the first period, 2, 8, 8, 18, 18, 32, 32, and so forth. Each new period begins with an element that contains an electron with a new value of n. Thus, any period may be characterized as that set of elements that begins with an element whose value for n equals the number of the period and whose value for l equals 0; all the initial elements of the periods are ns1 elements. Furthermore, the last element in a period has the same n as the period number and a value of l equal to 1; all last elements of periods are np6 elements. The first period is exceptional in that it lacks np6 elements and contains only 1s elements. Elements whose n equals the period number and whose value for l equals 0 or 1 are placed in A subgroups, that is, an electron shell is constructed around a given n. B subgroups consist of elements in which previously unfilled electron shells are filled; in these subgroups, n is less than the period number and l is equal to 2 or 3. The first, second, and third periods contain only elements in A subgroups. This method of constructing atomic electron configurations is not perfect, since precise limits between consecutively filled sub-shells are often crossed. For example, after completion of the 6s subshell in Cs and Ba, a 5d and not a 4f electron appears in La, and a 5d electron appears in Gd. Another disadvantage is that this practical method for constructing electron configurations could not be derived from any fundamental physical concepts; such a derivation became possible only upon application of quantum mechanics to the problem of atomic structure. The type of electron configuration in the outer shell is indicated in Figure 1 by asterisks and daggers; the type of configuration determines the major features of the chemical behavior of the element. These features are characteristic for elements in A subgroups (which are s- and p-elements), B subgroups (which are d-elements), and the f series—the lanthanides and actinides. The elements of the first period, H and He, are a special case: atomic hydrogen is highly active chemically because its single 1s electron is so easily removed, while the configuration of the helium atom (1s2) is very stable, which accounts for helium’s chemical inertness. As the outer electron shells—those with n equal to the period number—of elements in A subgroups are filled, the properties of these elements vary considerably with increasing Z. Thus, in the second period, Li (2s1 configuration) is a chemically active metal that easily loses its valence electron, while Be (2s2) is a less active metal. The next element, B (2s2p), is only slightly metallic, and all the subsequent elements of the second period, which have full 2p subshells, are nonmetals. The eight-electron configuration of the outer electron shell of Ne (2s2p6) is extremely stable, and, therefore, Ne is an inert gas. Chemical properties periodically change in a similar fashion for elements of the third period and in the s- and p-elements of all the subsequent periods, although the decrease with increasing Z in the strength of the bond between outer electrons and the nucleus in elements of A subgroups has some effect on chemical properties. For example, as Z increases, a significant increase in chemical reactivity is observed in s-elements, while an increase in metallic properties is observed in p-elements. In subgroup VIII-A, the ns2np6 configuration becomes less stable as Z increases, so that even Kr, which is in the fourth period, is able to form chemical compounds. The specific chemical nature of the p-elements in the fourth, fifth, and sixth periods is also related to these elements’ separation in the periodic system from s-elements by sets of elements in which all lower electron shells are filled. In the transition d-elements of B subgroups, incomplete shells with a value for n that is a single unit less than the period number are filled. The configuration of the outer shells in these elements is, as a rule, ns2. Thus, all d-elements are metals. The similarity in the structure of the outer shells of d-elements in all periods accounts for the lack of any great change in the properties of d-elements with increasing Z; a sharp difference is observed only when highest oxidation states are considered, in which case d-elements display a certain similarity with p-elements of the same group in the periodic system. Elements of subgroup VIII-B, with the exception of Ru and Os, do not tend to occur in higher oxidation states because the d subshells of these elements are nearly filled. In the case of elements of subgroup I-B (Cu, Ag, and Au), the d subshell is filled but not sufficiently stabilized, so that these elements can display higher oxidation states (as high as III in the case of Au). In the lanthanides and actinides, the previously unfilled f sub-shells with n two units less than the period number are filled; the configuration of the outer shell (ns2) is the same for all these elements. The f electrons of the lanthanides do not have a significant effect on chemical properties. The lanthanides predominantly occur in the III oxidation state because of the two 6s electrons and the one d electron that can be seen in the La atom. However, this explanation is not completely satisfactory, since a 5d electron is found only in La, Ce, Gd, and Lu; therefore, the III oxidation state in the remaining members of the lanthanide series is a result of the transition of one of the 4f electrons to the 5d subshell. In the actinides, the binding energies of the 6d and 5f electrons are very similar in elements with Z from 90 through 95; this explains the ability of these elements to produce compounds in a wide range of oxidation states (as high as VII in Np, Pu, and Am). For actinides in which Z is greater than or equal to 96, the III oxidation state becomes the most favorable. Consideration of the chemical properties of Ku and element 105 suggests the conclusion that systematic filling of the 6d subshell begins in this region of the periodic system. The causes and nature of the periodic change of properties in chemical elements with increasing Z have been explained above in general terms. This explanation is based on an analysis of the rules for forming electron configurations of free atoms. However, knowledge of the electron configuration of a free atom often does not lend itself to any positive conclusion about the most important chemical properties that are displayed by an element. 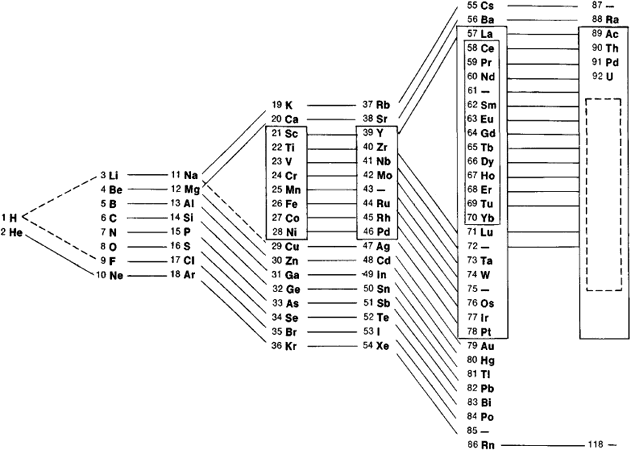 For example, the outer-electron configuration in both He and the alkaline-earth metals is ns2, yet the only similarity between He and the alkaline-earth metals is in certain features of their spectra. The principle of the periodic repetition with increasing Z of similar types of electron configurations is the basis for the periodic system of free atoms. The periodic system of elements reflects the regular change in the properties of elements as observed in chemical reactions. During the course of chemical reactions, rearrangement, which can sometimes be significant, of the electron configurations of the reacting atoms takes place, and a definite difference between the configurations of free and bound atoms exists. However, on the whole, a similarity between the electron configurations of free atoms corresponds to a similarity in the chemical behavior of the corresponding elements. A rigorous, quantitative explanation of the periodicity in the properties of elements and of all the specific features of the properties themselves is extremely complicated, and it cannot be said that a quantitative theory of the periodic system of the elements has been established. Individual aspects of such a quantitative theory are being developed using the methods of modern quantum mechanics. The upper limit to the periodic system of elements is still unknown, and, thus, the total number of elements that are encompassed by the system is also unknown. A limit to the synthesis of artificial elements has also not yet been found. All the known isotopes of elements with Z ≥ 101 have short half-lives. However, it has been proposed that the nuclei of the atoms of hypothetical elements with Z = 114, 126, 164, and 184 will not tend to undergo spontaneous fission, and thus the synthesis of such elements should be possible. Evaluation of the electron configurations and major properties of the unknown elements of the seventh period shows that these elements should be analogs of the corresponding elements of the sixth period. On the other hand, a very complicated pattern for the change of chemical properties with increasing Z is predicted for the eighth period, which consists, according to the theory, of 50 elements, since the order in which the electron shells of these atoms are filled changes dramatically. Significance. The periodic system of the elements has played and continues to play an enormous role in the development of science. A major achievement of atomic and molecular theory, the system has permitted a modern definition of the term “chemical element” and has clarified our understanding of elements and compounds. The relationships that are revealed by the periodic system have had a significant effect on the development of the theory of atomic structure and have facilitated explanation of the phenomenon of isotopes. The periodic system is a rigorous scientific treatment of the problem of prediction in chemistry: it allows us to predict both new features of the chemical behavior of known elements and the existence and properties of undiscovered elements. The periodic system is at the very heart of chemistry, especially of inorganic chemistry. It is a significant aid in synthesizing compounds with given required properties; in developing new materials, in particular, semiconductors; and in selecting specific catalysts for various chemical processes. The periodic system is also the scientific framework within which chemistry is taught. Mendeleev, D. I. Periodicheskii zakon: Osnovnye stat’i. Moscow, 1958. Kedrov, B. M. Tri aspekta atomistiki, part 3: Zakon Mendeleeva. Moscow, 1969. Rabinovich, E., and E. Tilo. Periodicheskaia sistema elementov: Istoriia i teoriia. Moscow-Leningrad, 1933. Karapet’iants, M. Kh., and S. I. Drakin. Stroenie veshchestva. Moscow, 1967. Astakhov, K. V. Sovremennoe sostoianie periodicheskoi sistemy D. I. Mendeleeva. Moscow, 1969. Kedrov, B. M., and D. N. Trifonov. Zakon periodichnosti i khimicheskie elementy: Otkrytiia i khronologiia. Moscow, 1969. Sto let periodicheskogo zakona khimicheskikh elementov: Sbornik statei. Moscow, 1969. Sto let periodicheskogo zakona khimicheskikh elementov: Doklady na plenarnykh zasedaniiakh. Moscow, 1971. Van Spronsen, J. W. The Periodic System of Chemical Elements: A History of the First Hundred Years. Amsterdam-London-New York, 1969. Klechkovskii, V. M. Raspredelenie atomnykh electronov i pravilo posledovatel’nogo zapolneniia (n + l)-grupp. Moscow, 1968. Trifonov, D. N. O kolichestvennoi interpretatsii periodichnosti. Moscow, 1971. Nekrasov, B. V. Osnovy obshchei khimii, vols. 1–2, 3rd ed. Moscow, 1973. Kedrov, B. M., and D. N. Trifonov. O sovremennykh problemakh periodicheskoi sistemy. Moscow, 1974.